Social Object: sculpture and software is an interactive software installation by Michael Rees that includes correlated physical objects with virtual objects. Interacting with artist authored software creates screen based experiences that construct virtual objects from which physical objects can be derived. The work explores the relationship between language and form and creates a framework for virtual and physical play. 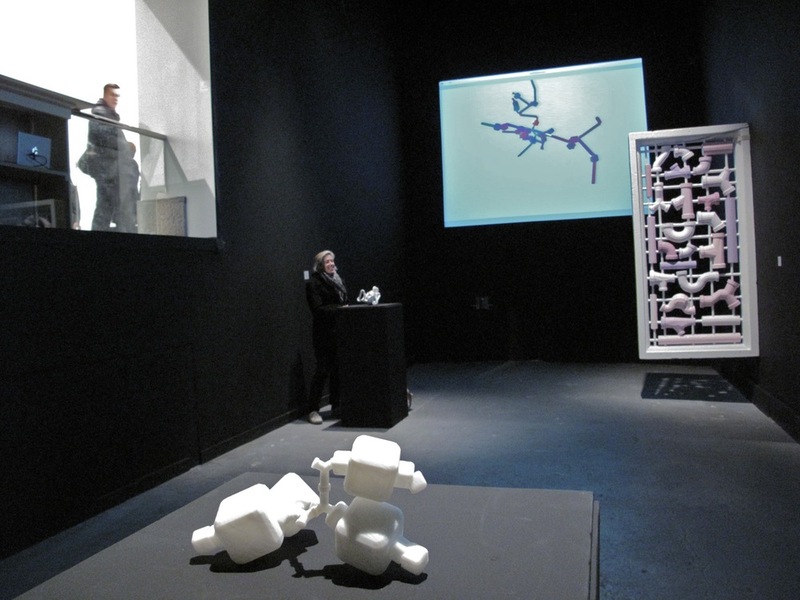 The exhibition includes the Sculptural User Interface (SUI) application, along with objects made from the SUI using contemporary automated sculpting processes. The SUI is a language to form synthesizer. The software generates 3D forms by typing letters on the keyboard. Many letters, words, sentences, turn into many kinds of shapes can be combined in multiple ways to create a rich user experience. 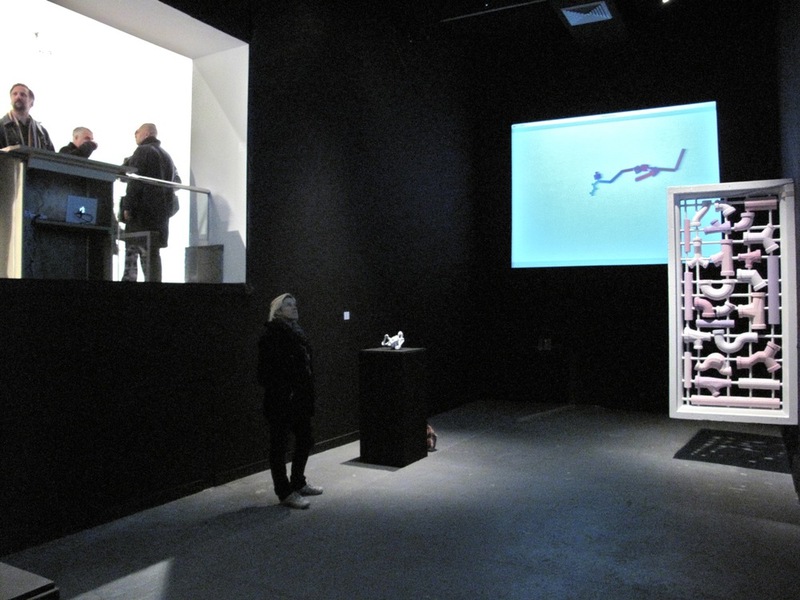 The exhibition includes the software Sculptural User Interface, along with objects made from the software. The Sculptural User Interface is a language to form synthesizer. Social Object and The Sculptural User Interface are inspired by Joseph Beuys' ideas about Social Sculpture, Duchamp's ready mades recapitulated by Joseph Kosuth as the ready made made ready and how these relate to the open source software movement. This project is made possible by grants from the National Foundation for the Arts, the Creative Capital Foundation and the Tribeca Film Institute's Media Arts Fellowships. Special thanks to Koan Jeff Baysa, Chris Burnett, NIna Colosi,Donald Guarnierri, and Kristofer Schlachter. We also would like to thank Geoff Flash and Brian McDonald of Kinnelon High School, in Kinnelon, NJ. The Project Room for New Media and Performing Arts (theprojectroom.org) is an incubator of new ideas, showcasing groundbreaking concepts in all art mediums, and the intersection of the arts through technology. Initiated in 2003 at Chelsea Art Museum (chelseaatmuseum.org) by curator, Nina Colosi, over 350 international emerging and established artists have been presented in exhibitions, performing arts, symposiums, meet-the-artist programs, and workshops. The innovative public art project, Streaming Museum (streamingmuseum.org) was launched on January 29, 2008. Supported in part, by public funds from the New York State Council on the Arts and the New York City Department of Cultural Affairs, in partnership with the City Council. The Experimental Television Center’s Presentation Funds program is supported by the New York State Council on the Arts. 2010 video talk about social object: sculpture and software at the Chelsea Art Museum. There are 8 segments on youtube.